By participating, volunteering, and sponsoring, we are able to contribute to the community we serve. Over the years we have created strong bonds with the community by proudly supporting The American Heart Association, volunteering with the Greater Boston Food Bank, collaborating at the YMCA's Educational & Training branch, as well as contributing to the success of Nurtury Boston. In every way we are committed to improving the education and social awareness of society, to create better lives. Giving back is more than just our responsibility, it’s a priority. JOHNLEONARD proudly honors and supports the YMCA Education & Training Branch in its mission to foster, “Better Employees, Better Lives & Better Communities through Innovative Job Training and English Language Skills”. They do this through providing education and training that opens up access to post secondary education as well as pathways to employment that offer family supporting wages and benefits to unemployed and underemployed adults in Greater Boston. The organization’s programs include English literacy classes, computerized office skills training, employment assistance, and career services coaching in close collaboration with the area’s best third level schools and employers. Not only has JOHNLEONARD sat on the board since 1984, we have been actively participating in every cycle since the organization’s inception. We continuously provide student and graduate training support, including resume help and interview tips, as well as best practices on how to progress in their desired careers. Graduates from the program have been successful in attaining a place in their school of choice or direct hire and temporary positions in professional roles such as Medical Reception, Claims Administrators, Patient Access Specialists, Customer Service Representatives, Financial Services Associates, and more. Over the years, these highly-valued trained candidates have created a distinct reputation with our clients and show no sign of slowing down. JOHNLEONARD has been a proud business partner of the American Heart Association for nearly two decades and is committed to this organization’s mission to promote healthier lives, free of cardiovascular diseases and stroke. 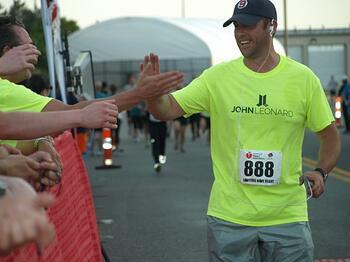 Since 2011, we have been proud participants in the annual Lawyers Have Heart 5k and summer celebration. Our team’s participation in this event began when a family member of one our team members was diagnosed with a heart condition. Since then, we have been actively involved in raising awareness of heart disease & stroke, which takes the lives of over 600,000 people every year in the United States, amounting to one in every four deaths every single year. JOHNLEONARD works with Nurtury to give “in need” children within the Greater Boston Area, from birth to age five, the opportunity to reach their full potential by investing in school readiness, promoting healthy development, and strengthening families. Like Nurtury, we believe in educating our community to guarantee the success of our future generations. We take pride in promoting a successful education system and in giving every child an opportunity to succeed.